I had another ago at tieing the stones in the silk cloth- this one was a little more successful but again the black seemed to seep much more than I wanted- it has created a nice piece of cloth but not quite what I had in mind. The effect I was trying to get was to make a small journal piece inspired by the marvellous wooden door from Damascus- these doors are so big and heavy and wonderful- I liked this one because of the panels. I also want to make a larger piece for an invitational I have been asked to participate in later this year in France, creating work inspired by the word Pierre- I wanted to get the feel of rocks and earth . But it also looks very carpet like very organic- I think it could look wonderful with some hand stitching- not quite sure what thread yet. The fabric did not turn out as expected- hmph! i will have to tie rocks again tomorrow. The thing I did wrong was not to dry it immediately so the black seeped into most areas and there is only minor contrast- a very nice piece of darkish silk, but not what I was wanting. 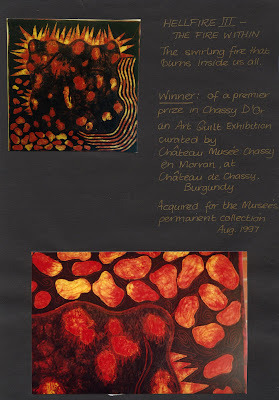 Perhaps it will be nice to print the lino cut I showed from last week onto the piece in a pearlescent soft orange. Spring is bursting here- finally- as I walk around and around our block ( after nearly being run over on the road a few years ago) i wear a track around the perimeters of our block- yes a bit nutso but beats being run over! 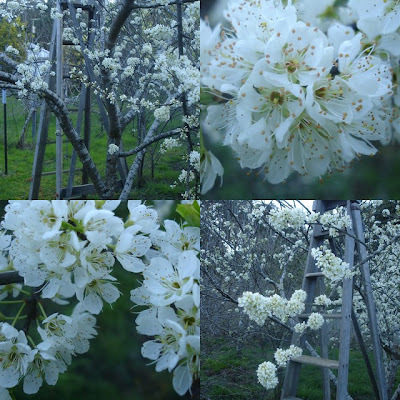 Anyway on my route are some of our plum trees- and they are in full bloom at the monent- the scent is heavenly and the bees are buzzing! I used 572 beans to be exact- and fortunately it did not take as long to untie as it did to tie. I also had to use the hairdryer to get the silk dry.The orangey/terracotta piece is what I ended up with. I had hoped the black would be a little more dramatic because as you can see the beans were quite black before I steamed them. The contrast is better than on the photos- the sheen of the silk seems to diminsih the contrast when phtographing. The othe rpiece is a piece of silk I tied rocks into. I have painted it and am waiting for it to dry. I tried reversing the colours - whether that worked or not remains to be seen. I have started walking again now that the weather is better-I must get better and walk in bad weather too. But it is good to be out walking again- - hope to build up to 10,000 dedicated step walks by the weekend as I want to get in a bit of foot toughening for Europe. I always find I do more walking in Europe than here. The towns there lend themselves so much more to walking andgetting things- and then there is Paris- walkers paradise! I have been tieing dozens of beans ( berlotti and canneloni) into silk with nylon knitting thread. Tomorrow I will dye it. It was so sunny the last couple of days that I was in a colour mood again- but alas today it was overcast with a bit of drizzle- grey day. This method of dyeing silk works best when its very sunny and it dries quickly.If its overcast again tomorrow I will perhaps use a hair dryer to get it dry. Any guesses for how many Beans I tied into the piece of silk- which was 50 cm by 120 cm long? It took quite some time! I also hand printed some pomegranates- I want to make more pomegranate postcards to take to Europe with me. I also have a couple of dye orders ( small ones to complete) but I keep putting it off- sometimes it is hard doing those have to jobs. I did sew some lettuce ( 3 different varieties) radicchio, tatsoi, cabbage and celery yesterday- hope it all comes up. The drizzle should do it good. 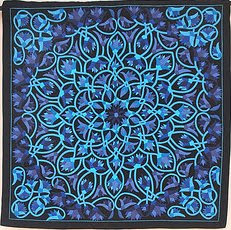 These photos are of work by Egyptian tentmakers from the Tentmkers Souq in Cairo. Jenny Bowker is bringing these wonderful pieces to Ste Marie Aux Mines including one of the tentmakers himself. Tentmaking is an age old tradition of creating hangings to decorate tents and any other festivities of the Egyptian people. 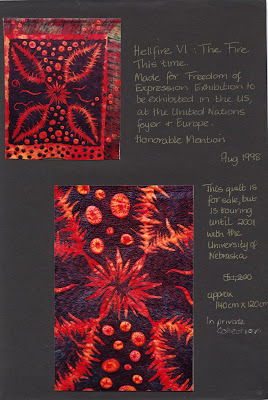 They are apppliqued by hand and not quilted- and show a high degree of craftsmanship- and are wonderful vibrant artistic expressions of cultural identity. The blue piece is by Ibrahim Asfoura and will be at Ste Marie aux Mines. The other piece, is one I purchased when in Cairo last year- and though I have the artists name on a card unfortunately with all my room moving I cannot locate it at the moment. I particularly loved this piece because of the very individual embroidery detail. There is also still places in my free machine applique and embroidery class and the journal class ( some of which I have discussed in posts from last week) My other two classes are full. 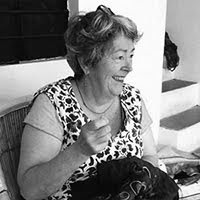 I have also had a cancellation of a class that was supposed to take place for a week long in Normandy in early October- if anyone is interested in me coming to teach in France, Belgium, Holland or England please let me know - as of course such a cancellation does impact quite substantially on the budgetting for this trip. This photo is of the centre of a protea when it has finished flowering and has died off- isn't nature amazing. During the week I went to Melbourne and one thing that struck me was the amount of construction that was going on- the largeness of the houses being constructed, and the largeness of the cars on the road- so many fourwheeldrives in the city, cars so large that you have no idea of traffic conditions ahead. It started me thinking about consumption and energy- the earth is a finite resource- when it is gone there is no more- why do some people so obviously consume so much more than others? You might say user pays, but on the other hand why should I try to be careful with energy ( and I am aware that I consume also) when others are so reckless with it? For example we have been told by our water supply company- that exciting exploration is going on , drilling natural springs in this region- which have fed this region from the beginning of time in order to supply resource thirsty Greater Geelong.All I see happening in Geelong is construction of ever larger houses with at least two if not three bathrooms that churn all this water. We bought land that had been cleared at the turn of the nineteenth century because we did not want to cut down any bush and we also wanted to plant some non-native fruit trees plus a few ornamentals. We did however plant native indigenous corridors along our boundaries for wildlife and birds- and they are very attractive as well. We bought the seeds from a local nursery specialising in raising native seed stock employing people with disabilities. We have a large vegetable garden - almost big enough to feed the neighbourhood and we share a lot of what we grow with neighbours and friends. There is five months of the year where we do not have to buy fruit or vegetables- and even in winter we still have a good assortment of vegetables - if we can stop the bower birds eating everything. We also have a lot of fruit trees- many varieties of apple ( who love this region) citrus, nut trees and grape vines.We also use non-hybridized seeds ( from Eden Seeds in Queensland)and old varieties for vegetables, we companion plant to control pests and use no chemicals. We compost heavily and mulch heavily and everything is watered from the dam ( often by hand) We grow green manure crops rich in nitrogen to help build the soil. We are not quite permaculture but do employ a lot of permnaculture techniques. I also preserve a lot of what we grow. We recycled an old house built in 1948 which was going to be demolished and moved it onto our land- it is not big and it is not a palace, but it is sturdy and is a roof over our heads. We do not use a lot of heating, wearing jumpers and socks instead. My children shower every second day ( to conserve water and so the hot water system can run on energy saving)- humans don't need to shower every day- and there is always a basin and wash cloth. Planning needs to be used if you want a shower if going out somewhere. In warmer months we have an enormous outdoor room as big as a palace that requires no heating, cooling or lighting and that is big enough to share and watch the celing of stars. We have enough dead wood from our plantings to have an occasional camp fire outside. We use the washing machine gray water for the garden. We do have two cars but the car we use most if a Nissan Micra which tiny and is very fuel efficient, and is suitable for most of the running around we need to do- unfortunately you only get to look at fourwheeldrive bumper bars. The station wagon we use if we need to haul anything or when we go away as a whole family. I feel that many people pay lip service to energy conservation and recycling and treading lightly and I am getting angry about it- because from what I saw from my little car the other day , the kind of consumption that is going on cannot be sustained and will interfere greatly with the future of my children. 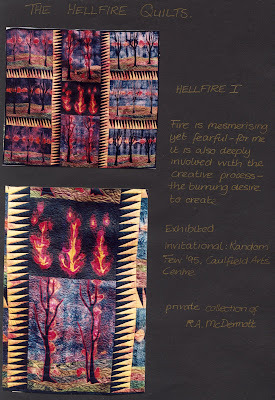 More Hellfire quilts. If you click on the image a larger image will pop up. I am starting to feel a bit overwhemlmed by all the preparations i still have to do before I leave for France on 10 September. I always get this sense of panic as time lines approach. I have decided not to work on anything large before I leave, and I did want to revamp my journals class. Someon asked about that class- you will not be working to my themes- Chassy or Syria , but they are merely examples of how you can develop your own theme and methods and techniques you can use towards developing not only a journal project but also a larger body of work- the aim is to inspire , and really open doors. Leanne asked if I always transferred my drawn image to my lino with a sharp tool and the answer is not usually, but the symmetry of this image was so formal that I wanted it to be as acurate as my drawing. Normally I draw straight onto the lino, and I also use texturing as part of the image. I have to write my lecture that I am giving at Val d'Argent as my french is not good enough for a lecture and it will need translation- this is a bit new to me as I tend to adlib and talk to images, so having to write things down for translation is a bit daunting and inhibiting.I often spark off facial expressions in the audience and even questions.The blurb for my lecture says:" In my travels I have been fortunate to encounter cultures and traditions which are rich in textiles- the language of cloth and stitch.The colours and the form of stitching and weaving often contain patterns and forms which can be a source of cultural pride and recognition whilst others speak of a universal language for textile artists". I have a question do you think the blurb is wide enough for me to include some of my own textile reactions/creations to my encounters? 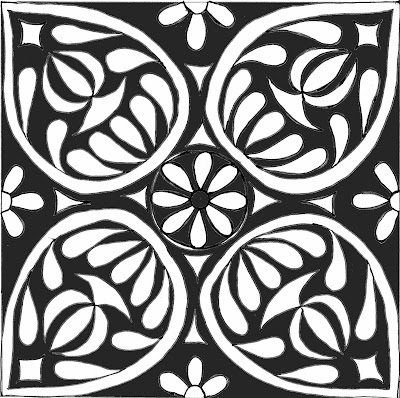 I traced the pattern onto the lino with a sharp instrument and then cut the pattern into the lino. I printed onto cotton and habutai with textile printing ink ( Trapsuutjies). I like the effect on the habutai- the softness of the fabric contrasting nicely with the "hardness" of the pattern. 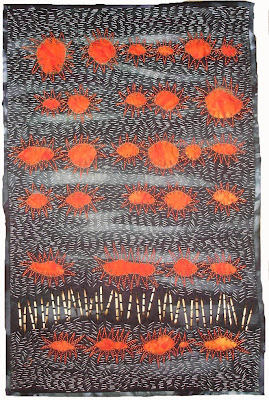 I can see dense hand stitching in the areas that are orangey/pink- or perhaps dense machne stitching- so that the pattern stands out as relief. I am still thinking about it. 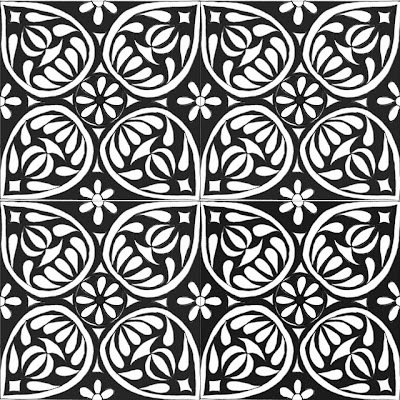 The linocut I made is a bit different to the original woodblock which looks as if it is an outline block and the different parts of the pattern would have been painted in different colours. Damascenes decorated everything and were highly skilled in painterly effects. It may even be a block to print onto ceramics and again different sections of the print would have been painted in different colours. I have been playing and developing an lino-cut for one journal piece about Syria. The woodblock stamp is one I found in the Azem Palace in Damascus and which I was allowed to photograph for a little baksheesh. There was a whole collection of woodblock stamps in the textile area of the palace- where cloth for palace use was woven and printed. This wood block was my favourite for its very formal symmetry. 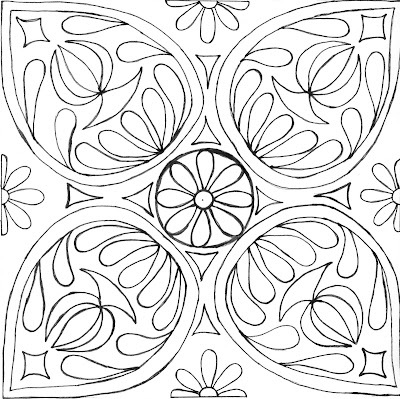 I drew the motif onto paper and then scanned it into my computer and used the paintpot fill function to create the positive/negative image. I sometimes do this to work out balance. I then collaged it in Picasa. I have now made the lino-cut and printed the fabric but I can't upload any more photos so you will have to wait until tomorrow. I want to thank each and everyone of you for your very kind responses. I know I am not the only person to whom this has happened and that there are many similar stories out there, and I appreciate some of you taking the time to share those stories to reassure and to help soften the very real situation in which I find myself. Sometimes you need to hit rock bottom to be able to climb out again. I have decided I am in no state to deal with the garage workroom situation, at the moment and as I will be going to France in 3 weeks to teach at Val d'Argent. I am going to focus on the journal project I will teach there as well as in Belgium. I had done journal quilts in relation to the experiences of Chateau de Chassy some years ago and have used them as the basis for the class in the past- but as I am without my main machine at the moment I have decided to do some journal quilts in relation to Syria- to show students how to focus on elements of a visual experience, how to use photos and different techniques to develop work in a cohesive expressive manner. 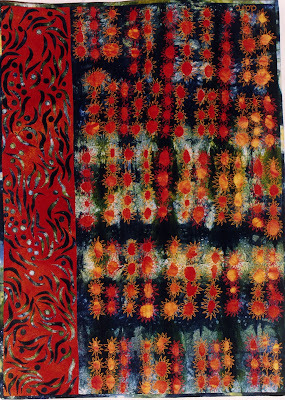 Susie asked for pictures of my other Hellfire quilts- I will post those I can find photos of in the next few days- in the days before digital I was sometimes a bit slack in recording- though mostly I did have them photographed- so some are slides and I can't find the scanner slider dooverwackie thing at the moment- could be anywhere. 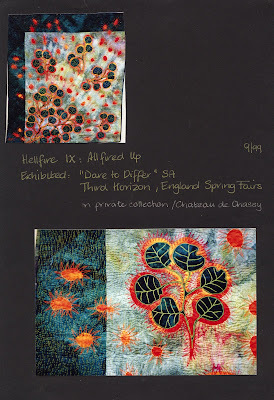 So the photos are of Hellfire I, Hellfire II, Hellfire III and Hellfire V. As I was scanning I realised that I seem to have 2 Hellfire XIV's- and they are distinctly different from each other. I must have lost count. There is no doubt that apart from Gellibrand being a beautiful nature region it is also the home of many many spiders. They weave their webs anywhere and everywhere. When I set out on the road to creating and making a living from my creations I imagined myself having a studio- but instead I find myself in ever smaller spaces in which to create work- and in one word it is making me very depressed along with the many other things that have happened to family in the last 12 months. We have dealt with a governmental system that sees parents have no rights not even in the mental health care of a child whom the parents believe has problems- I have seen my middle daughter once in 10 months because she refuses to come home- not once has she given a reason apart from a blanket statement which is not borne out by the evidence and which everyone apart from her agrees is not borne out by the evidence, even the government department we are dealing with.It makes me incredibly sad and yes I am grieving. The thing that is hard to deal with everyone says it is for the best ( and I have to say many people ignore it completely- not one word of sympathy or care or even asking how the other children are faring)- and in some ways maybe that is true but another part of me keeps asking how did it go so wrong- and what do I do with this love that I have? I know it stays but sometimes it seems to be too much too bear. So to ever decreasing space. My husband has all but taken over my shed ( true some of my things are still in there)it was going to be my wonderful studio- a space to work and teach- and now I am in a small space at the back of the house with lousy natural light, and nowhere near enough space to envision anything. I gave up my other workspace to my eldest daughter who really needed her own space- it was high time. But how can I work in this space??? Bring on the warm weather and sunshine- at least there is no shortage of outdoor space here- but it keeps on raining and it is cold ( August is usually the coldest month) so no hope of doing any work outside. What webs we weave in our lives. I had not imagined myself in this place, in this space,in this state of mind. It is finished! My middle right hand finger is a bit red raw- I don't like wearing thimbles and in the end it took a lot of sewing but I do like how it turned out- the texture of the hand stitching really adds something to the whole. It measures 33cm ( 14 inches) by 53 cms (21 inches) It is forsale- for $300 US. If you ar einterested please contact me . 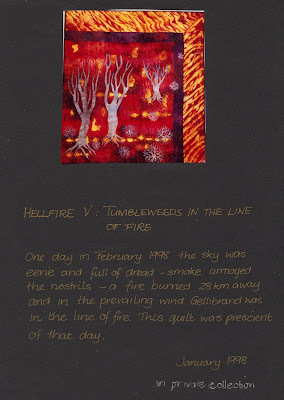 This piece is part of an ongoing series of Hellfire quilts. I have made 19 big ones and a some little ones- I just make one when one drops out of the sky. My husband said at one stage- you have probably made enough- but then one keeps turning up- sometimes 2 or 3 will come in a rush, but this time it's been 18 months waiting. I don't sit and work at them as a series as such, just make them when they call. I have sold all but one half of a diptych ( someone who lived on a houseboat bought the other part of the diptych) and one which is on display at La Bourboule. The title of the series came about by accident. 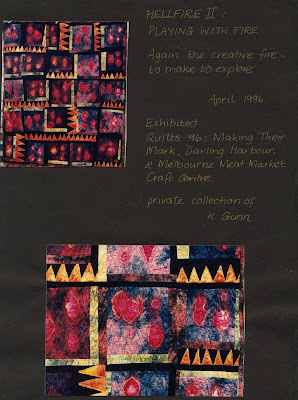 I was invited in 1995 to be part of an exhibition with some wellknown Victorian quilt artists. At the time I was preganant and must admit vegetated a bit until the baby was nearly due ( the exhibition started 6 weeks after she was born). Anyway I dyed some fabric for a quilt, and when it was dry brought it inside and put it on the table. I had lit a small candle and forgotten that I had and the fabric I had brought in I put on the candle. Of course it started burning- and as I had just waddled off somewhere and was on my way back I came to the table with the fabric starting to burn. I yelled out " Hell Fire!" 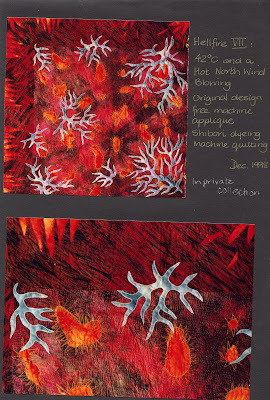 to get my husband to come and help and so was born the title for the series- beceause we did manage to stop the fabric burning- but I found it left interesting holes which I could immediately see as fire quilts. The dawn was very beautiful this morning- an intense pink red- it backlit the trees that looked black against the light.